Lets take a look at another custom things project! One of the 3 games I mentioned that I’ve made some custom stuff for is for a contest, so I won’t be posting about that until the results to that go up, although I really want to, but there’s still one I can talk about! Recently, this has jumped far into the lead as my most frequently played game. It’s a deck-building game where the players control a group of super heroes fighting off an mastermind, who’s trying to complete some kind of evil scheme. The game is based off the Marvel universe, as as a result holds high appeal to myself and to pretty much all of my friends, which is partly why it gets played so much! In the game, players recruit heroes from a set of 5 in each game, which each have unique skills and abilities, such as taking wounds to deal massive damage (Hulk), or getting rid of them to draw cards (Wolverine). The bad guys in the game are sorted into various groups, which are of two types – villains and henchmen. 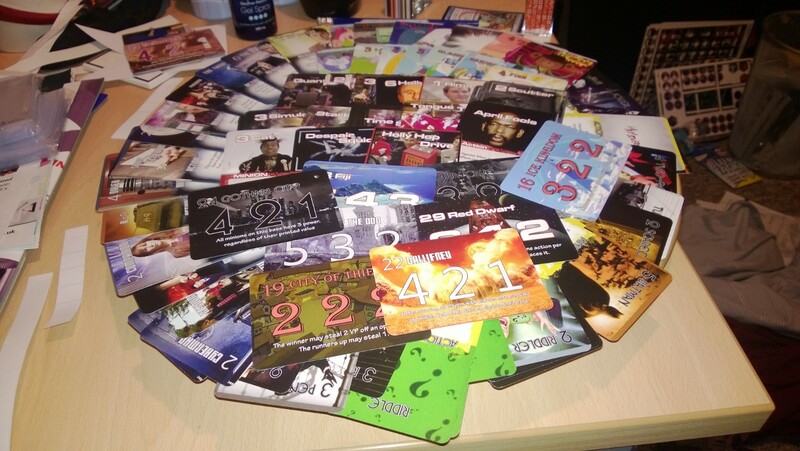 These all get shuffled into a deck, with some bystanders and general effect cards (Master Strikes, Scheme Twists), one of which is drawn at the start of each players turn. Heroes. Each hero has 14 cards, which is made up of 2 Commons (5 cards each), an Uncommon (3 cards) and a Rare (1 card). The cheaper cards tend to be something of ‘enablers’ to held activate or empower the uncommons and rares for a hero. This might mean for example that they help you rescue bystanders, with an uncommon that gains power for each bystander saved. Masterminds. Each mastermind has 5 cards, 1 is the mastermind itself, and 4 are ‘tactics’. The mastermind card tells you certain information for set up, and has a ‘master strike’ effect, that occurs when one of 5 master strike cards in the villain deck are drawn. The tactics cards each have an effect which occurs when you fight the mastermind, sometimes for better, and sometimes for worse. Villains. Villain decks are 8 cards, which I ‘think’ have 4 different named cards in each. They can have an ambush (When drawn), fight (When fought) and escape (If they reach the end of the city track) effect, though not necessarily all or any of those. Henchmen. Henchmen decks have 10 cards, all of which are identical, after all they are meant to be nameless minions. They are quite weak, and more often than not have a beneficial effect when defeated. Scheme. Each game you choose a scheme for the mastermind. This has a major effect on each game, such as turning heroes into villains, destroying city spaces, doling out wounds, and more. Each scheme has a criteria under which evil is victorious, which you should probably beat the mastermind before that happens! They use the Scheme Twist cards, (usually 8, but can be less, or up to 11) which normally go into the villain deck to affect the game when drawn. There”s a few other types – bystanders, officers and wounds, but they are less customizable (Well, maybe bystanders, but I’ll leave them for now!) due to having a more passive role in the game. That’s a lot of things! At first it seems pretty daunting, but it’s very easy to focus on a small aspect of them. I’m tackling a few at once, because I want to make my custom addition to the game fit a particular storyline. In particular, those depicted in ‘Captain Britain and MI13’, which had a short run a few years ago, and is a semi-sequel to Excalibur, apparently, I’ve not read it to really know! I bought the comics after finding out that there’s a hero called ‘Captain Midlands’ in them from a magazine, something that I, being from the Midlands, just had to read…I can’t imagine someone from here being a hero at all ^^. So I have a setting, now I just need to pick bits from it to work on. I wrote myself a list first of all the key things I wanted to do, although I don’t have any particular intention of a stopping point for all this, in fact I may read Excalibur when i run out of things to add just to keep it up! Lets have a look what I’m working on. Heroes – My current list of heroes added from the series consists of the Black Knight, Captain Britain, Captain Midlands, Faiza Hussain, Pete Wisdom, Spitfire and Union Jack. Mastermind – Just the one so far, Plokta, a duke of hell. His name just comes form ‘Press Lots of Keys to Abort’, although for what reason i can’t imagine, but I do find it amusing! Scheme – 2 Schemes to start with, ‘Dream Corridor’ is from the same storyline as Plokta, and ‘Steal Britain’s Magic’ is another key one, which takes part during the Secret Invasion storyline in the Marvel universe, with the invading Skrulls attempting to steal our sources of magical power. Henchmen – In the comic, plokta is trying to capture people in his dream corridor to drain their energies, which he uses to make Mindless Ones, they seemed pretty hilariously easy to beat though, despite attempts to make them sound like terrible enemies in the text, so I made them henchmen for now! I guess they are as strong as the source which makes them, which is in it’s early stages in the books. If you’ve played Legendary, you’ll realise from the pictures that I haven’t kept the exact same style. It’s not that I don’t want to, but I simply couldn’t find anything high enough resolution to look good, and I didn’t want both the borders AND the background images to look terrible, so I went about coming up with my own. There’s nothing much to them, as I kept the same general style as the standard ones, but the pictures are fairly high resolution ones I found of the Captain Britain and MI13 comics, so they look pretty cool anyway (At least in my opinion! ), plus it makes my work that bit more unique, which I quite like (I really loved that doing the Smash Up customs, all the styling was unique for each faction, so there was no feeling of being carbon-copies of the base game!). Next step will be printing off on paper or card, and playing a game where my deck gets sleeved up as I play. Hopefully it’ll turn out to be fun as is, and if not, balancing time. When i can get them to something satisfactory (Not necessarily perfect) then I’ll be sending off an order to PrinterStudio to get some more sturdy cards to play with, and they’ll be added to the box with everything else, I can’t wait! Thanks for reading! It’s ever so fun to write all this stuff, and seeing that I have a reader count higher than 0 is just awesome! This entry was posted in Board Games, Variants and tagged Board Game, Custom, Gaming, Legendary, Variant on September 12, 2013 by Smoothsmith. So I find myself wanting to write something about the various custom content I’ve made for the board games I own. There’s 3 of my games that have received this kind of attention – Smash Up, Legendary and Viticulture. I’ll go through the first of those now, and perhaps post about the others later. One of the games that I’ve played the most in my collection is Smash Up. It’s a fairly simply card game, where each player takes 2 factions of a variety of themes which they shuffle together to make their play deck for a game. Each faction has a unique focus, for example zombies retrieve cards from their discard pile, wizards manipulate their deck and aliens beam things up! Players then take turns playing a minion and an action each turn, to try and capture a set of bases laid out on the table. The nature of the game makes it extremely attractive towards having variants made for it. Each faction consists of 20 cards, in a roughly 10 minion/10 action split, and most cards have a few copies. As a result, when I came up with the idea of trying to make some kind of custom game/content for my girlfriend for her birthday, this took the lead in my attentions. I had to start somewhere, and that somewhere was what factions I was going to add. I could have gone for something similar to the base game, somewhat open thematic ideas like pirates/ghosts/etc, but a far more fun idea was to base it on more specific things, TV Shows, Films and the Like. Batman – With my girlfriend being the target, this was an obvious choice. It’s a particularly awesome universe, and many of the characters are styled in a way that she loves, it just had to go on. Red Dwarf – I don’t even need to argue this, Red Dwarf is just an absolutely awesome example of British comedy at it’s best. I love the series and still hope for more, even if it’s impossible for them to live up to the stellar standard of the earlier series’. Doctor Who – While she’s less than enamored with Doctor Who, she does like the series somewhat and it’s so varied and exciting to me personally that I wanted it to make an appearance. Adventure Time – I never seem to want to watch Adventure Time on my own, but I do enjoy watching it with others, it’s a rather insane series vaguely targeted at children which was bought up a few times, and just felt right as an option that my girlfriend would love. So I found some free time and set to work on thinking what the cards would do. Rather than stick to an overlying mechanic for each deck, I decided on which characters and props to include first, and worked from there. The Scutters for example, reduce a bases breakpoint, while Candy Kingdom people are low power, with a boost when they get surprised, or when Princess Bubblegum is around to motivate them. To actually make the cards, rather than try to hack together some cut and paste of my own, I opted to make use of a proper service for printing cards. I did some research, and found both artscow and printer studio as options, with the latter working out cheaper if I did enough cards (236), I only needed 88 for this project, so I found a quarriors harry-potter card set and got those printed too (I haven’t used them though, sadly!). Here are the results! This entry was posted in Board Games, Variants and tagged Board Game, Gaming, Smash Up, Variant on September 11, 2013 by Smoothsmith.